Only days after he arrived at the Magazine Publishing Institute in Kenya this fall, a classmate he was discipling narrowly escaped death when his friend was killed for taking a public stand for Jesus. While he grieved for his friend and considered returning to Nigeria, his commitment to raise up the next generation of followers of Jesus compelled him to stay. Why was Magazine Training International’s conference so important to Nuru? “The conference gave me all I need to know to launch my magazine next year,” Nuru said. The publication, to be called “World Changers Magazine,” will focus on training young Nigerians. At the MTI training, Nuru and his colleague, Alex, gained practical tools for the next steps in the publishing process, and connected with experienced magazine personnel from across Africa and around the world. This network of relationships will help them continue to learn as they move forward. Nuru’s own faith journey started in high school. Growing up, his father was Muslim and his mother was Christian. As he considered whether to follow Jesus or Mohammad he prayed to God, not knowing who he was, other than the creator of his soul. One night he had a dream about a specific page in the Bible. On awakening, he found a Bible and read that page, discovering the story of the conversion of Saul. As a result of that dream and the testimony of a Christian friend in high school, he became convinced that Christianity was the way for him. 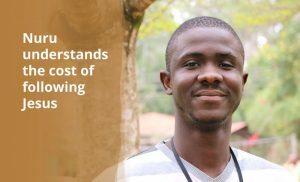 After Nuru left home for college, he had the opportunity to start fresh as a Christian. He joined a Bible study and was discipled to build a strong faith foundation. Now, more than a decade later, Nuru continues to lead others in growing as disciples of Jesus. Through a publication equipping young people in Nigeria, he will be used by God to continue to change the world, starting with the youth of Nigeria! Please consider making a donation to give leaders like Nuru the tools they need to reach their community.